Hey friends! Today’s blog format is going to be a little different because it’s a BIG update! First, apologies for the email repeats you may have noticed over the weekend. We aren’t sure what happened but we are investigating! We suspect it may be related to the big changes ahead for us at Ever Thine Home, the purpose of this update to you. Secondly, next month we celebrate our 7th birthday!!! You have loved us well and helped us grow into a sustainable, stand-alone brand, with a flourishing blog and a line of beautiful biblical items and products for your home. So we want to say THANK YOU! Celebration perks coming soon, so watch your inbox! Finally, as a part of Dennis’s and my transition into a new season of ministry alongside FamilyLife, Ever Thine Home will be on its own starting June 1, a gift from FamilyLife with the full support and enthusiasm of everyone involved. 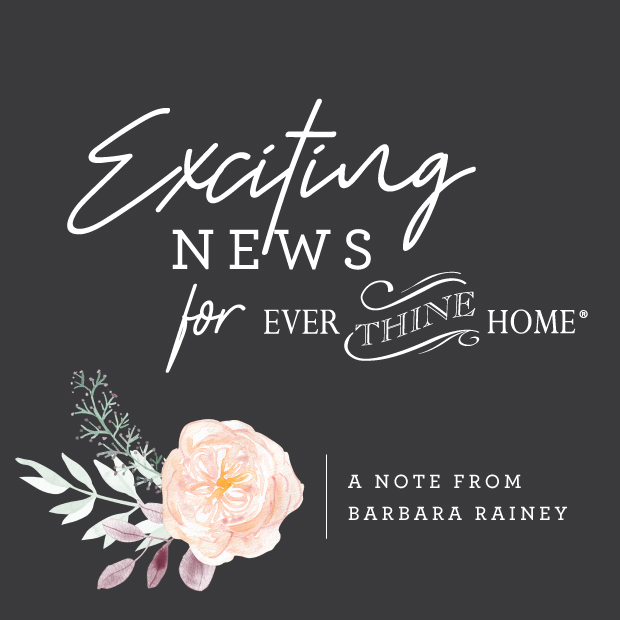 With your support behind us and our excitement about God’s new calling, we are busily working on making Ever Thine Home even better as a new and separate 501c3 nonprofit ministry. You will notice some changes this summer like fewer posts per week and a new shop page but many things won’t change. Most importantly I will continue to mentor you on womanhood, marriage, and mothering through blog posts, both the Dear Barbara posts and other topics that will help you live and grow in your faith. Dennis, our daughter Laura and I are excited about this next step for Ever Thine Home and our community with all of you. Providing truth and beauty for your home has been our hallmark from day one seven years ago. Our byline, believe beautifully, will not change!